CADILLAC BROUGHAM. 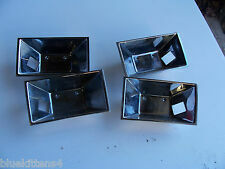 SET OF 4 DOOR HANDLE TRIMS -. FITS LEFT & RIGHT, FRONT & REAR. USED PART SEE PHOTO CLIP - THSCRATCHES OR MARKS. THERE ARE SCRATCHES MARKS ON EVERY USED PART. THERE ARE SCRATCHES IN EVERY USED PART. AT BLUE KITTENS OEM USED AUTO PARTS We disassemble a used car discard any junk parts and salvage the good parts. GM CADILLAC PART NUMBER. COUPE DE VILLE. FELT WORN -. PASSENGER - RIGHT DOOR PANEL. WINDOW TRIM. CADILLAC FLEETWOOD BROUGHAM. AT BLUE KITTENS OEM USED AUTO PARTS We disassemble a used car discard any junk parts and salvage the good parts. LEFT REAR INSIDE DOOR TRIM PANEL. OEM USED ORIGINAL CADILLAC GM PART NUMBER. COUPE DEVILLE. GLOVE BOX DOOR. GM CADILLAC PART NUMBER. COUPE DE VILLE. 1977 COUPE DE VILLE. AT BLUE KITTENS OEM USED AUTO PARTS We disassemble a used car discard any junk parts and salvage the good parts. COUPE DEVILLE. ARMREST ONLY AS SHOWN. GM CADILLAC PART NUMBER. COUPE DE VILLE. 1977 COUPE DE VILLE. Manufacturer Part Number USED ARMREST. PASSENGER - RIGHT REAR. AT BLUE KITTENS OEM USED AUTO PARTS We disassemble a used car discard any junk parts and salvage the good parts. Interchange Part Number 1ga0165714. Interchange Part Number 25773154. Interchange Part Number 25718632. Interchange Part Number 450-1036-03f. Interchange Part Number 25773162. Interchange Part Number 12040 c.
BROUGHAM FLEETWOOD. used oem original cadillac gm part number. DOOR PANEL ONLY -NO SWITCHES OR SWITCH TRIM. OEM USED - RIGHT FRONT DOOR PANEL -. PASSENGER SIDE FRONT DOOR SWITCHES & TRIM NOT INCLUDED ON THIS PANEL. DOOR PANEL ONLY -NO SWITCHES OR SWITCH TRIM. OEM USED - RIGHT REARDOOR PANEL. SWITCHES TRIM NOT INCLUDED ON THIS PANEL. PASSENGER SIDE REAR DOOR NO SWITCHES NO WOOD GRAIN SWITCH TRIM. BACKING PANEL DOES HAVE CRACKS. DOOR PANEL ONLY -NO SWITCHES OR SWITCH TRIM. PASSENGER SIDE REAR DOOR NO SWITCHES NO WOOD GRAIN SWITCH TRIM -. OEM USED - RIGHT REARDOOR PANEL. SWITCHES TRIM NOT INCLUDED ON THIS PANEL. NO SWITCHES OR SWITCH TRIM DOOR PANEL ONLY. OEM USED - RIGHT REARDOOR PANEL - GRAY. PASSENGER SIDE BACK SEAT. AT BLUE KITTENS OEM USED AUTO PARTS We disassemble a used car discard any junk parts and salvage the good parts. THERE ARE SCRATCHES MARKS ON EVERY USED PART. FLEETWOOD D'ELEGANCE. OEM USED ORIGINAL CADILLAC DOOR PANEL GM PART NUMBER. CADILLAC d'Elegance. DOOR PANEL ONLY -NO SWITCHES OR SWITCH TRIM. PASSENGER SIDE REAR DOOR NO SWITCHES ARE INCLUDED ON THIS PANEL. OEM USED - LEFT REAR DOOR PANEL. DOOR PANEL ONLY -NO SWITCHES OR SWITCH TRIM. SWITCHES TRIM NOT INCLUDED ON THIS PANEL. PASSENGER SIDE REAR DOOR NO SWITCHES NO WOOD GRAIN SWITCH TRIM -. NO SWITCHES OR SWITCH TRIM DOOR PANEL ONLY. Interchange Part Number GMX295. Interchange Part Number 00022945. Interchange Part Number 000 229 45. Interchange Part Number 09262005. Interchange Part Number P15945643. Interchange Part Number ZFW1C-5. CADILLAC ELDORADO. SPLIT BENCH SEAT. 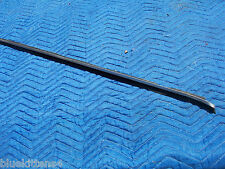 OEM USED ORIGINAL GM CADILLAC PART Part Number. BLUE RIGHT HALF. USED WEAR - A FEW BLEMISHES. AT BLUE KITTENS OEM USED AUTO PARTSWe disassemble a used car discard any junk parts and salvage the good parts. SEDAN DEVILLE. DONOR 1975 SEDAN DEVILLE. LEFT REAR DOOR PANEL UPPER SECTION. UPPER TRIM WEATHERSTRIP IS MISSING. AT BLUE KITTENS OEM USED AUTO PARTS We disassemble a used car discard any junk parts and salvage the good parts.